Scottish Play Doe (please just call him Scott) has always been a little weird, what with his migraines that make him see really strange things, but everything in his life gets a lot weirder when his family moves to Goodborough (home of the GoodCo Cereal Company) and one of his hallucinations steals his backpack. And then it turns out he hasn’t been hallucinating at all: he can see things no one else can, and oh yeah, that includes cereal mascots that might actually be faeries… and they’re all on the run from GoodCo itself. With the help of his new friends Erno and Emily (who have their own weird connection to GoodCo), plus Mick the leprechaun, Harvey the rabbit man, and a suspiciously hairy housekeeper named Biggs, Scott has to figure out what’s really going on at GoodCo… and how to save the world from one seriously sinister cereal company. Although I never got around to Rex’s second book, Fat Vampire, Rex was on my list of authors to watch after I finished The True Meaning of Smekday a few years ago. 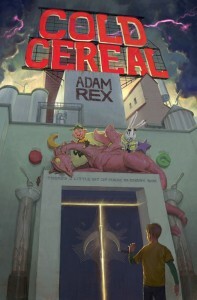 And considering the two books, I feel safe in saying this: Adam Rex is a very entertaining writer and illustrator, but his Achilles heel is definitely pacing. Something was distinctly off about the way the tension in Cold Cereal built, and I think it comes down to the fact that there were about three different books in this book. Basically, in this one (very long for middle grade) novel, you’ve got way too many elements at play: a creepy cereal company, some Irish/Celtic mythology, time traveling King Arthur, freemasons, and more. And that is just… a lot. Too much. They are all cool ideas, and they tie together eventually, but it also becomes kind of a jumbled, confusing mess. And, because there are just so many elements that need to be pulled together, getting all the pieces in play, moved to where they need to be, and set up for the climax, takes a lonnnnng time, and makes things feel kind of bumpy and uneven. But on the plus side, a lot of the ideas are really enjoyable and entertaining. Sinister cereal company that uses faerie creatures as mascots? HECK YES. And the time traveling King Arthur idea was really cool. Also, while Scott and Ernesto were both basically everykids, Emily was wonderful — she’s a supergenius, smart enough that she’s figured out a lot of what’s going on before everyone else, but no one believes her, but also smart enough to understand that and deal with it. And smart enough that when her brother tries to make her feel better for being a social outcast, she doesn’t really want to hear about it. She knows people don’t like her and she doesn’t want to be condescended to about it, frankly. That was a small piece of the story, but a great touch. Overall, the book was enjoyable. There are a lot of good gags and Rex’s tone is funny and entertaining. But when I got to the end and realized that it’s the first of a trilogy, instead of jazzed for more, my reaction was, “How is it POSSIBLE that there’s more?? ?” So, while it has the same pacing issues as Smekday, it doesn’t deal with anything deeper than the surface story the way Smekday did. thus Cold Cereal gets three cupcakes. This entry was posted on Sunday, January 29th, 2012 at 1:40 pm and is filed under 3 Cupcakes, Contemporary/Urban Fantasy, Fairy Tale/Mythic, Humor. You can follow any responses to this entry through the RSS 2.0 feed. You can leave a response, or trackback from your own site. For whatever it’s worth, I was awfully disappointed with Fat Vampire when I finally read it a couple of months back. It was dull and largely unfunny. Alas.